lancerlord@tomorrow.sg picks up on a Telegraph article asking "why are there still ashtrays in the Airbus A380?" Good question, but not the only example of seemingly stupid "missed opportunities" to innovate in the A380. One of the first I noticed was the new positioning of the inflight entertainment controller in the seat back. At first it seems perfect, since it avoids the accidental activation which is a real problem when the controller is built into the armrest (which is the case in most other cabin fitouts I've seen). But then consider the way it is oriented - mounted on the side. This results in a classic failure to "get the mappings right" (one of Norman's design rules in "The Psychology of Everyday Things"). If you use the controller without removing it from its holder (which turns out to be a very handy usage), then you need to transpose the controls 90°. Up means right, down means left etc. Ironically, when the controller is mounted in the armrest, the horizontal layout tends to "get the mappings right" if you use it in-situ because of the way the hand is positioned. It could have been so perfect if the controller designers were collaborating with the seat designers, with a clear focus on usability. The controller could be mounted vertically, or redesigned for a side-side layout. As it is, a missed opportunity to produce the very best design. And a very, very minor usability problem is one of my lasting impressions of my first A380 flight, overshadowing all the billions of euros invested in the plane. But as I look around the cabin more and more people are using their own earphones. The ones that aren't probably forget to bring the special adapter. 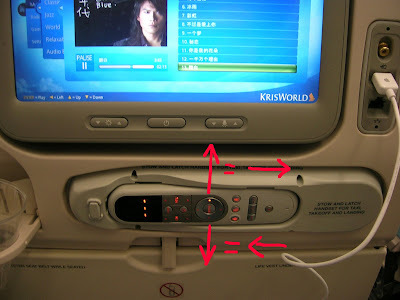 For planes like the A380 starting their service life in the 21st century, I'd expect it would be the norm for most air travellers to be carry a headset of some description, and it would make sense for cabin designers to take advantage of the fact and use standard audio sockets, and provide headsets "by exception". Win-win: passengers get to use their own familiar headsets without needing an adapter, and cabin crew get to save time for more important things.